Hi, im new to the page and cant wait to see all the awesome done up lancers. Would love a front lip for her but cant find anything, thinking im gonna have to find a different bumper just to attach one? Keen to hear from you all. Silencer wrote: Hi, im new to the page and cant wait to see all the awesome done up lancers. plus great honey sweet sound. A good start for future performance mods: I too have a MY15 ES Sport. fitted 215 60 16 Bridgestone turanza serenity plus tyres. Much quieter and more comfortable car. Able to speak in whispers, front and back seats at 100kph. But yes I have added insulation as well. Spray on sound deadener under car an have also sound proofed boot and boot lid. Still catching up with the rest of the intended sound proofing. Doing all myself. Not bad for Geriatric delinquent!! ! bundle of fun and joy, toy that I bought. Love my car. PS what state do you live in, I'm in Victoria. Currently living in Brisbane, previously from Sydney but before that, Boston MA. 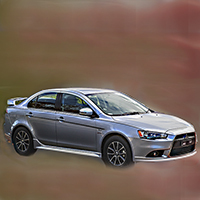 Bought my 2015 Ralliart Lancer a Little Under 2.5 years ago. His name is Bruce & he’s a beast! Cant wait to see what I learn from you guys. Excited to finally have people, other than my Dad to talk about cars with. My Fiance isn’t into cars AT ALL, so this club is gonna be awesome! 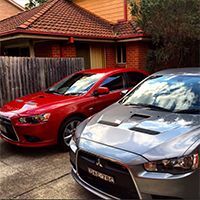 I recently purchased a 2012 Lancer VRX and am from Queensland, Australia! Hope to get some great tips from here! Besides the CE Lancer Coupe and the S40Volvo, (not to mention the Datsun240Z,yes there is a CJ) in the driveway, I like the marque. I changed to King Springs at 62K and immediately had creaking sounds - I suspected that the shocks were too long and caused issues to the top mounts (maybe 15mm to 20mm), and at around 100K the shocks failed. Could anyone recommend a product (KYB/Bilstein, etc) they would be satisfied with given a variety of road surfaces. I occasionally do forest rally's and support for AMSAG events, as an official on not always good surfaces. The King springs gave no appreciable difference on road and have been less than satisfactory in most surfaces due to I suspect being not being a higher spring/wire diameter (measured against standard springs). Hey Paulo,there isn't much available KYB or ULTIMA are about it. We use Ultima as replacements in customer cars at work and they appear to be quite good. Don't know if they make a heavy duty type for the Lancers you'd have to check with them. Going to Johns River in March? Yes, Johns River is definitely on the calendar! Will look up KYB/ ULTIMA - thanks for your suggestion. 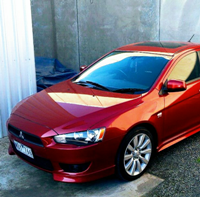 I’m from Adelaide and am in the process of buying a 2012 VRX Sedan. I have a list of modifications I want to do but not the knowledge to go with it, which is why I joined this page. 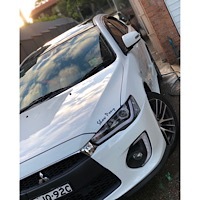 I am a P Plater and want to ultimately make my car look as sporty and as close to an Evo X as possible (yes one of those guys). If anyone has any helpful information for me that would be much appreciated. For the rear bumper swap and I was thinking of doing a bonnet swap aswell, do the parts from a RalliArt lancer fit onto VRX and CJ models? They do indeed, most parts are interchangeable, panel wise, there were some exhaust changes between 2011 and 2014, there is something in another thread about that, or could be the chat. but most other parts are homologous between models. Like said above^ only parts that want swap are some panels from the EVO due to is being wider then the lancer and Ralliart, so you won’t be able to swamp bumpers, mainly just bonnets! Hi all, Names Rohan owner of a 2017 ES lancer. thanks for letting me join. Was wondering what sort of mods or upgrades i can do to the car. So far i was looking at spoiler, rims, and maybe lowering it, then get a new exhaust system.